Rowaid Market 2123 90th Ave., Oakland, CA, 94603 Dec. 14, 2016. A shopper leaves a neighborhood store, Rowaid Market, one of the three new healthy corner stores bringing fresh produce and an increased volume of healthy food options to the community. It has undergone major changes to increase access to fresh, healthy foods and to decrease promotion of unhealthy products, such as alcohol and tobacco. The transformations are part of a larger partnership between Mandela MarketPlace and the Alameda County Public Health Department that aims at helping local food retailers improve community access to healthier foods while also boosting opportunities for local economic growth. Rowaid Market 2123 90th Ave., Oakland, CA, 94603 Dec. 14, 2016. 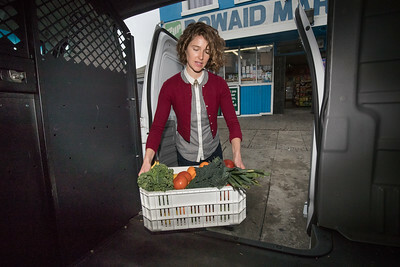 Josephine Radbill, Heathy Retail Coordinator, removes a delivery of locally grown fruits and vegetables to Rowaid Market, 2123 90th Ave., Oakland, one of the three new healthy corner stores bringing fresh produce and an increased volume of healthy food options to the community. It has undergone major changes to increase access to fresh, healthy foods and to decrease promotion of unhealthy products, such as alcohol and tobacco. 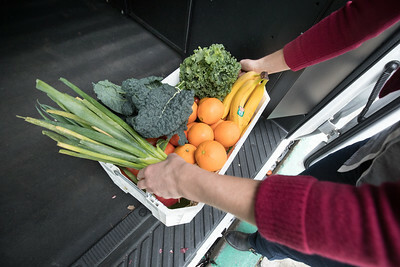 The transformations are part of a larger partnership between Mandela MarketPlace and the Alameda County Public Health Department that aims at helping local food retailers improve community access to healthier foods while also boosting opportunities for local economic growth. Rowaid Market 2123 90th Ave., Oakland, CA, 94603 Dec. 14, 2016. 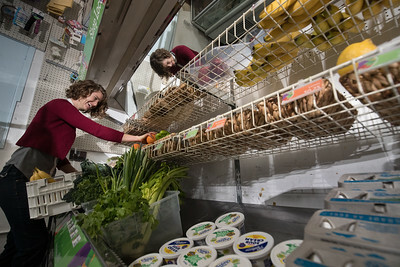 Josephine Radbill, Heathy Retail Coordinator, lifts a basket of fruit and vegetables at Rowaid Market, 2123 90th Ave., Oakland, one of the three new healthy corner stores bringing fresh produce and an increased volume of healthy food options to the community. It has undergone major changes to increase access to fresh, healthy foods and to decrease promotion of unhealthy products, such as alcohol and tobacco. The transformations are part of a larger partnership between Mandela MarketPlace and the Alameda County Public Health Department that aims at helping local food retailers improve community access to healthier foods while also boosting opportunities for local economic growth. Rowaid Market 2123 90th Ave., Oakland, CA, 94603 Dec. 14, 2016. 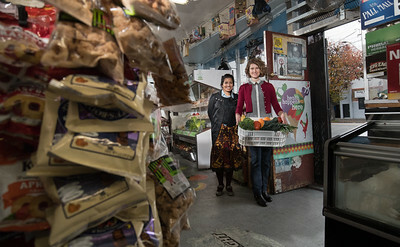 Trisha Chakrabarti, Program Policy Manager and Josephine Radbill, Heathy Retail Coordinator, with a basket of fruit and vegetables at Rowaid Market, 2123 90th Ave., Oakland, one of the three new healthy corner stores bringing fresh produce and an increased volume of healthy food options to the community. It has undergone major changes to increase access to fresh, healthy foods and to decrease promotion of unhealthy products, such as alcohol and tobacco. The transformations are part of a larger partnership between Mandela MarketPlace and the Alameda County Public Health Department that aims at helping local food retailers improve community access to healthier foods while also boosting opportunities for local economic growth. Rowaid Market 2123 90th Ave., Oakland, CA, 94603 Dec. 14, 2016. 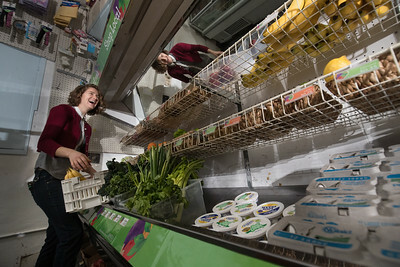 Josephine Radbill, Heathy Retail Coordinator, stocks the refrigerated display with fruit and vegetables at Rowaid Market, 2123 90th Ave., Oakland, one of the three new healthy corner stores bringing fresh produce and an increased volume of healthy food options to the community. It has undergone major changes to increase access to fresh, healthy foods and to decrease promotion of unhealthy products, such as alcohol and tobacco. 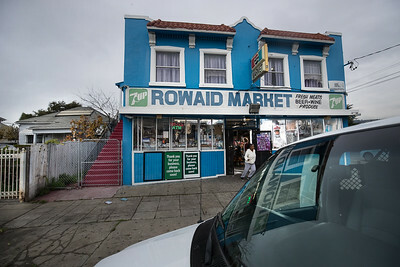 Rowaid Market, 2123 90th Ave., Oakland, one of the three new healthy corner stores bringing fresh produce and an increased volume of healthy food options to the community. It has undergone major changes to increase access to fresh, healthy foods and to decrease promotion of unhealthy products, such as alcohol and tobacco. The transformations are part of a larger partnership between Mandela MarketPlace and the Alameda County Public Health Department that aims at helping local food retailers improve community access to healthier foods while also boosting opportunities for local economic growth. Rowaid Market 2123 90th Ave., Oakland, CA, 94603 Dec. 14, 2016. 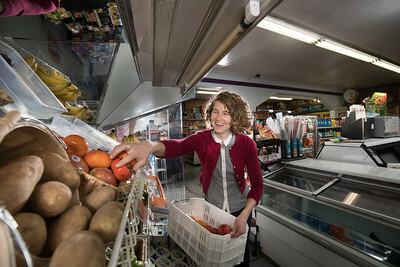 Josephine Radbill, Heathy Retail Coordinator, stocks the refrigerated display with fruit and vegetables at Rowaid Market, 2123 90th Ave., Oakland, one of the three new healthy corner stores bringing fresh produce and an increased volume of healthy food options to the community. It has undergone major changes to increase access to fresh, healthy foods and to decrease promotion of unhealthy products, such as alcohol and tobacco. The transformations are part of a larger partnership between Mandela MarketPlace and the Alameda County Public Health Department that aims at helping local food retailers improve community access to healthier foods while also boosting opportunities for local economic growth.